When should these be used? There are three medications currently available for doctors to prescribe to help with weight loss. Xenical, Reductil, and Acomplia have all been shown to promote weight loss over and above that achieved by lifestyle change, by about 4kg on average. They should never be viewed as a substitute for improved dietary habits and increased activity. But when should you consider asking your doctor for them? 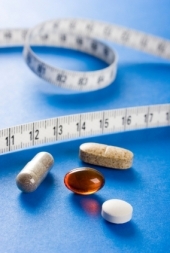 Doctors recommend the use of weight loss medication when lifestyle change doesn't produce the desired amount of weight loss, which is usually judged to be around 10% body weight loss. There is also an argument for using them to help keep weight already lost, off long term though some doctors struggle with this concept. You might also be considered if you have lost some weight but have started to "plateau", or even regain a little. To be suitable for a prescription you need to have a BMI of 30 or above, or 27 and above if you already have high blood pressure, diabetes, or heart disease. To continue with the prescription you would need to show weight loss averaging around 5% body weight over the next three months. Ultimately however, without long-term lifestyle change, any weight lost through medication will be short lived so it's essential that your focus remains on improving your diet and increasing your activity levels. Which drug is best - Xenical or Reductil? Well, it depends! Results from trials show little difference in overall effectiveness. However they work very differently. Xenical reduces the amount of fat absorbed from the diet in the small intestine by about one third. The problem is it still has to go somewhere so the more fat you eat, the more is not absorbed, and the more is passed back out! A low fat diet therefore is essential otherwise you may run into problems with oily stools, some leakage, stomach cramps or even diarrhoea. It can be taken indefinitely if it works. Reductil can be taken for 1-2 years maximum. It works on your brain making you feel fuller for longer, the result is that you eat less; by about one fifth. Common side effects are headache, dry mouth, constipation, but 2% of users show an increase in blood pressure. You need to have your BP checked every two weeks for 3 months. It is not suitable for people with heart disease, thryoris disease or depression and can interact with some other drugs which your doctor would check for.